Mad Dog could tell I was about to lose it. I was unsuccessfully trying to get little T.Puzzle to poop on the potty, which let’s be real, may not happen until he reaches puberty, and Full Speed was not helping the situation. Both boys were fighting and misbehaving and I couldn’t take it anymore. That’s when Mad Dog took over. He told me he would watch the boys for the afternoon and made me some appointments at the spa. Then, when I returned, he hired a babysitter and took me to a lovely dinner. Little T.Puzzle looked befuddled. “You’re not my father,” he said. We all stopped and looked at him trying to figure out what he was getting at. “You are my DADDY!” Oh, well that makes sense I guess. I had a wonderful time at the spa. I even went to the shops they had nearby. It is an amazing feeling to walk into a store and not have to worry about spontaneous wrestling or the possible breakage of merchandise. I’m telling you it’s the little things like this that bring out the most joy in life. When it was time to hand over the little men to the care of the babysitter, I was filled with apprehension. Not because of her, she was perfectly kind. It was BECAUSE she was perfectly kind. I worried the boys would be so out of control she would be tempted to toss them over the balcony. They really hadn’t behaved very well for the past several days. I could also tell by Mad Dog’s wearied expression and the shortness of his fuse that the boys had been in their full glory for their afternoon of ‘just the guys’. While Mad Dog and I dined, I expressed my frustration with little T.Puzzle’s terrible threeness and Full Speed’s naughtiness. I was feeling like quite a failure in the motherhood department and was just about ready to quit my ‘job’ and outsource it to a nanny, neighbor or relative. I let it go after a bit. I think the two glasses of wine with dinner helped me to do so. When we returned to our room, I cautiously crossed the threshold and waited to hear the horrible tales of what had transpired in our absence. And you know what? The babysitter had nothing but positive things to say. In fact what she said was glowing. My boys were ‘incredibly sweet’, ‘got along and played together great’, ‘were courteous’ and she even went so far as to say I was doing a good job as a Mom. I bit my tongue because my sarcasm was screaming for me to ask her if she had tripped at some point and had hit her head. 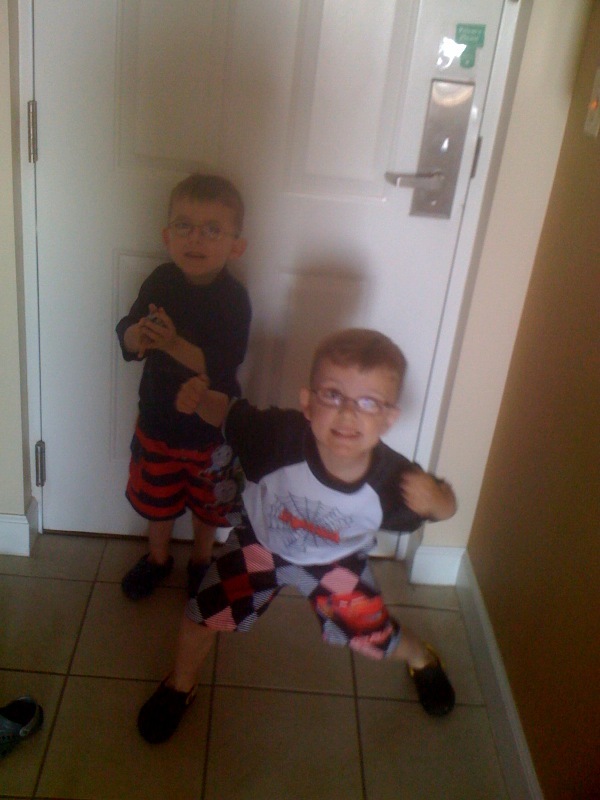 I couldn’t fathom that the two boys I left behind were so amazingly well-behaved. It felt really good to have an outsider approve of the job I’m doing after a rough couple of days. So, now we are wrapping up our family vacation adventure. 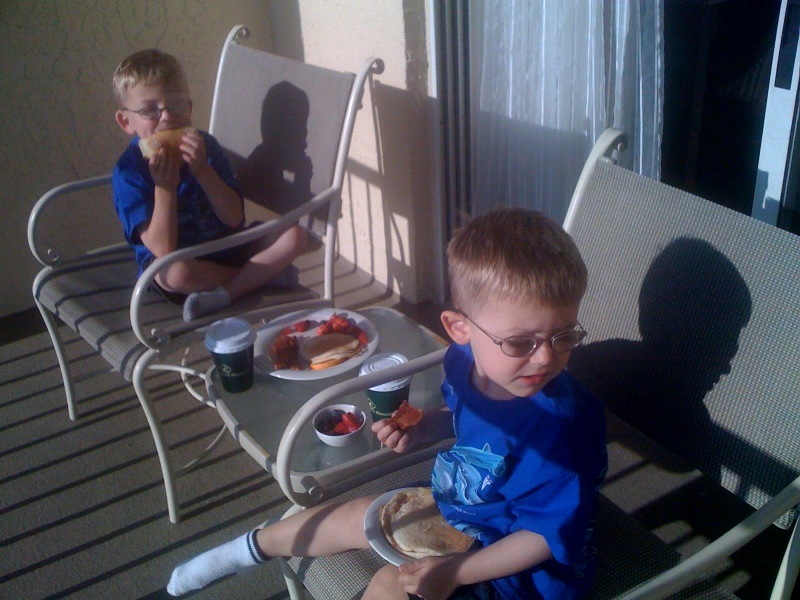 We started our day off with a room-service breakfast which the boys ate out on the balcony. Yum! 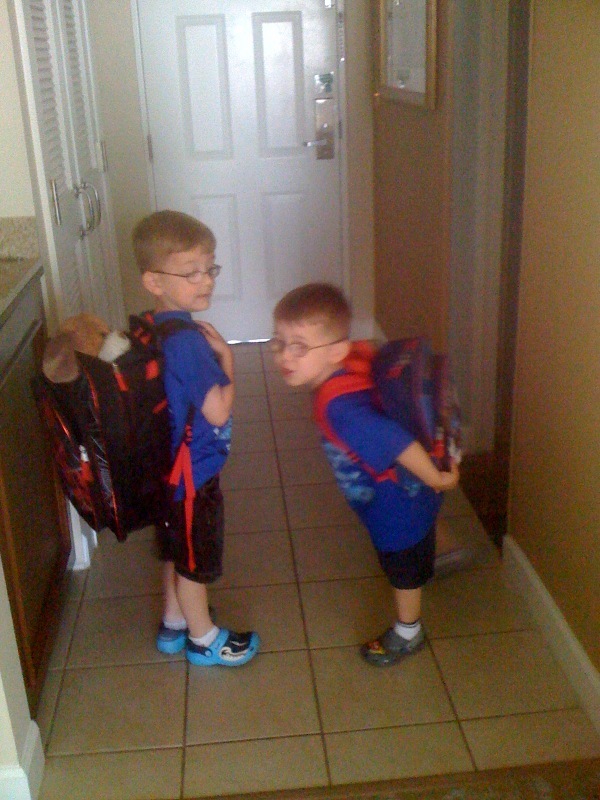 Then, it was time to take my two over-the-top and thankfully, very cute and lovable boys, pack them up and hit the road for home. And, I know the adventure doesn’t end even though our vacation did. oh and I forgot to say major points for spa day!! !